To kick off 2019 National Volunteer Month, the Muscular Dystrophy Association was honored to welcome Marriott International volunteers from all over the world into our Chicago offices on Friday, April 5, as part of Marriott’s Serve 360 event. Continuing its tradition of making its communities better places to live, work, and visit, Marriott International this year chose MDA as one of its largest partners in activating Marriott’s sustainability and social impact platform, Serve 360: Doing Good in Every Direction. Four thousand Marriott associates from all over the country participated in several acts of service around Chicago, including performing service projects for health-related organizations, revitalizing community parks, beautifying neighborhood schools, replenishing public gardens, and assisting in various shelters and offices across the city. This event furthered Marriott’s goal to contribute 15 million hours of volunteerism in its communities around the world by 2025. 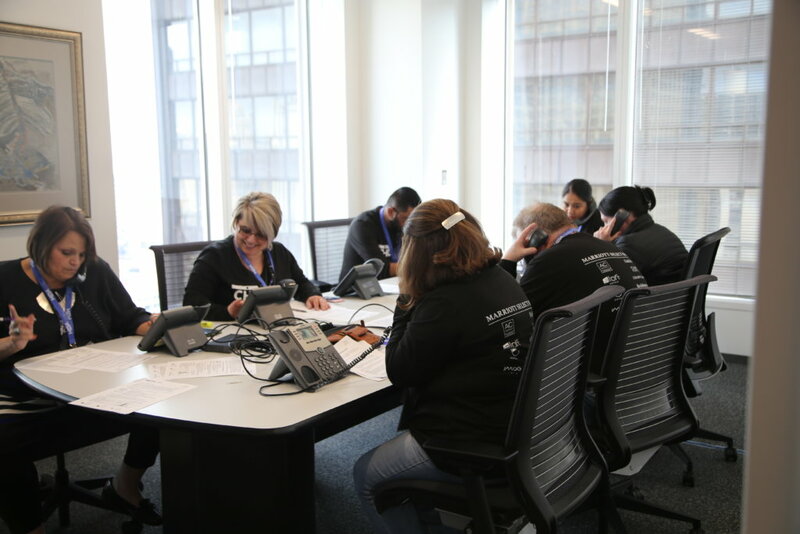 Marriott International volunteers make calls in MDA’s Chicago office. While on site at MDA’s offices, 45 Marriott volunteers were able to complete 500 calls, 300 hand-written thank you notes, and various other projects to support MDA’s event participants, sponsors, and donors. Volunteers assembled goodie bags to be given out to children at local MDA Care Centers at hospitals in Chicago and began assembling materials for the upcoming Byline-Bank Chicago Spring Half Marathon & 10K, of which MDA is the official charity partner. The Marriott Serve 360 event was a tremendous way to kick off National Volunteer Week, and propelled MDA forward as it approaches a busy event season this spring. MDA is sincerely grateful to Marriott for its service. If your company is interested in setting up a corporate volunteer day with MDA, contact Alison at 312-525-8818 or atibbits@mdausa.org.